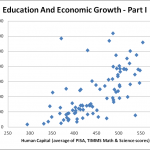 Human capital (primarily education) is the single most important factor behind long-term productivity gains, and hence economic growth. The relatively high human capital of Russia and China, which is comparable to developed country levels, is the most important reason why I rate their future prospects much higher than those of the other two BRIC’s, Brazil and India. But the internal distribution of human capital is also very important. For instance, in Italy there is an almost perfect correlation between regional PISA scores in Math and Science, and regional GDP’s. I have long wanted to find a similar data set for Russia, and I finally did so today in Jarkko Hautamäki’s slideshow comparing regional PISA performance in Finland and Russia. 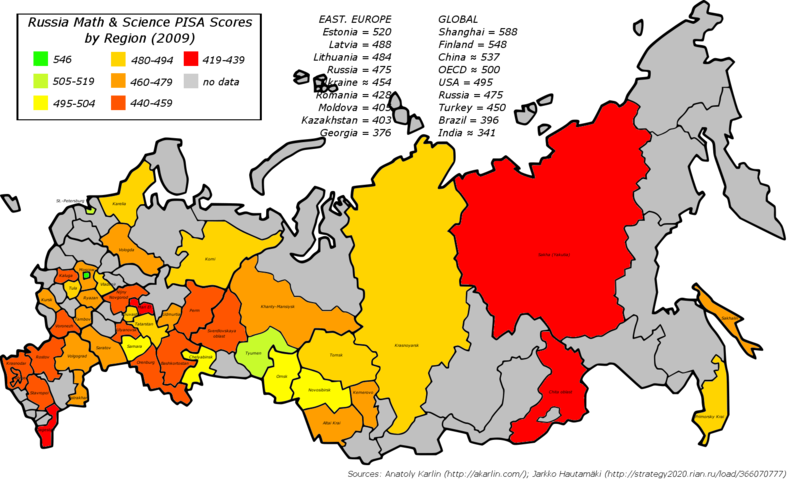 Based on the figures there I estimated the PISA scores (Math and Science) for Russia’s regions and compiled the map below. (1) In some regions, margins of error are high, as samples were low. Nonetheless, it is still possible to identify concrete patterns. (2) Moscow pupils performed very well, at the level of the highest scoring OECD countries like Finland, Taiwan, and Korea. This is especially impressive considering the significant numbers of immigrants in that city from the North Caucasus and Central Asia, who come from poorly-scoring countries and rarely have good Russian. (3) St.-Petersburg and Tyumen oblast performed above the OECD average, while a few other regions performed at or only slightly below the OECD average. 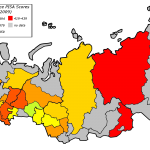 (4) Among ethnic Russian republics, Siberian regions performed well, while the Urals and southern regions performed badly. (5) Performance in ethnic minority republics differs dramatically. Many of the Turkic and Finno-Ugric regions, such as Tatarstan, Komi, Chuvashia, and Karelia did well; however, Mari El is a big exception. The Buddhist peoples of Asia, such as Chita oblast (now merged into Zabaykalsky Krai) and the Sakha Republic, performed relatively poorly, as did the Muslim North Caucasus region of Dagestan. Extrapolating from Dagestan, Chechnya would probably score around 400, i.e. like Brazil. Bear these figures in mind when considering long-term investments into Russia alongside with their business climate, corruption levels, etc. Finally, there is a table below comparing individual Russian regions with countries around the world. 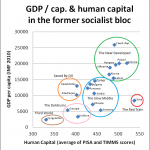 (The Ukraine didn’t participate in PISA 2009, but extrapolating from its TIMMS scores, its rating should be around 454. The OECD average is about 500.) I have bolded countries and Russian regions which are especially useful, in my opinion, for comparative purposes. * Methodological note: In reality, the figures given were for all three components of PISA (i.e., Reading, as well as Math and Science). I just assumed there is a perfect correlation in relative performance in Reading as compared to Math and Science (a valid one, I think, as the cross-national evidence indicates this relation is very close), and adjusted from Russia’s Math and Science score. 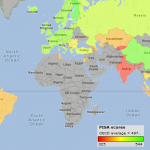 The reason is for the Russian figures to have compatibility with my Human Capital Index, which is the average of PISA and/or TIMSS Math & Science scores.